This is my final post about gender biases at work. I've been inspired to write these 4 posts following a session I attended at the NESA Conference about women in leadership, where videos by Joan C. Williams were shown and discussed. This post is about the tug of war bias, and in a way this is the saddest of all biases as it is about women working against other women at work in order to advance themselves. This bias also includes the 3 previous patterns of gender bias, for example women often apply harsher standards of competence to other women than they do to men (which then works towards reinforcing the "prove it again" bias). In addition, women can also increase the feeling of judgement based on male and female attributes (being competent -v- being liked). Women with children are also criticised by other women in ways that they wouldn't think to comment on in men with children - and often this is because these same women are also in situations where they are also struggling to find their own balance between family and career. 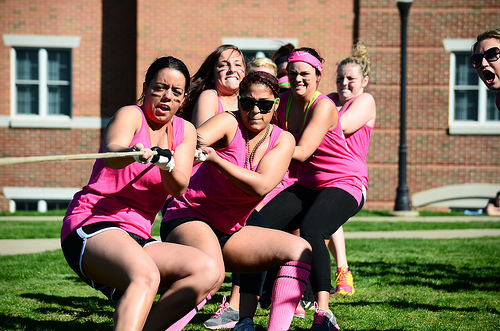 The tug of war can be especially strong in older women who have struggled to get where they are today and who unintentionally resent the way that younger women may not have these struggles. Assuming the best of other women - stop judging them. Resolving conflicts with female colleagues - don't ignore the problems and allow them to create more tension. Find opportunities to collaborate with other women. Respecting each other's diverse experiences. Mentoring other women can build positive and supportive working relationships. Advocating for other women, especially in situations where they appear to be ignored.